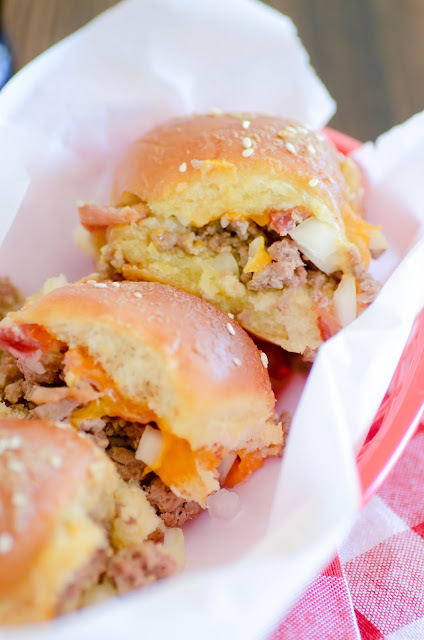 These Bacon Cheeseburger Sliders are so easy to throw together for a crowd and perfect for game day! I am so, so sad that it took me so long to get this recipe posted. I've had it up my sleeve for a couple of weeks, just waiting for the week before the Super Bowl to share it with you. Wellllllllllllp. Nothing like the 11th hour, huh? 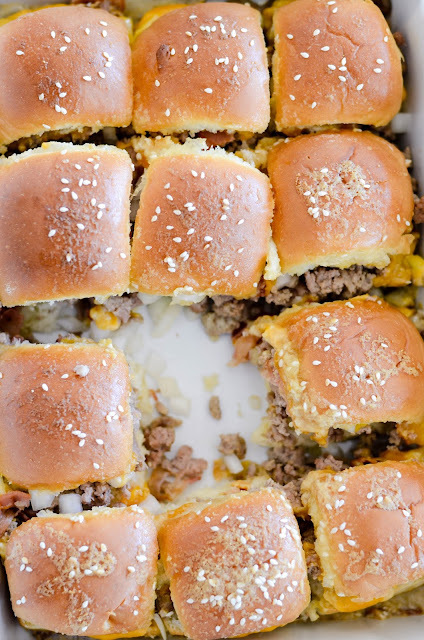 These sliders are a dream. I'm telling you, if you're having people over for the big game, this is the way to do burgers!! Throw them all together, a few minutes in the oven, and wham bam-- you've got an amazing game day entree fit for a crowd. One that's incredibly easy to double too. And customize! Just like a pizza, you can change these up-- add pickles to one batch. Or maybe BBQ sauce. Thousand Island dressing would give them a "Big Mac" flare that could be delicious. The sky is really the limit here. But if you're looking for a starting point, allow me to suggest bacon, bacon, more bacon, onions, and cheddar. 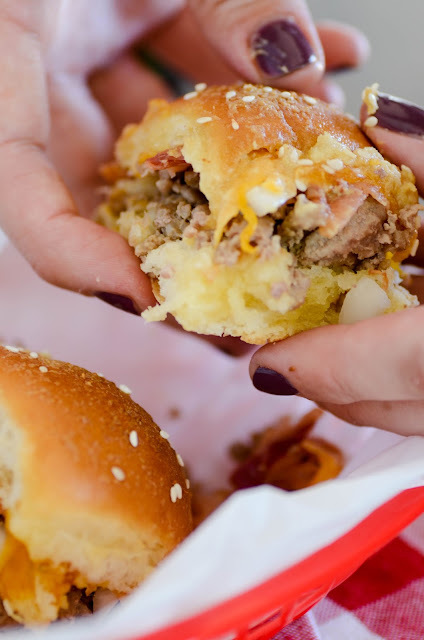 It doesn't matter which team you're rooting for this weekend-- I think we can all come together over bacon cheeseburgers. Amiright?! Separate the tops from bottoms of the rolls, and place the bottom pieces into a 9x13 baking dish. Layer the ground meat over the rolls. Next the onions and bacon. Finally, place the cheese slices on top. Place the roll tops over the cheese layer. Whisk together the butter, mustard, worcestershire sauce, and sesame seeds. Brush mixture over the rolls. Bake for 15-20 minutes until cheese is melted. Serve warm.